Rochel Sylvetsky is Senior Consultant to Arutz Sheva's English site and serves as op-ed and Judaism editor. She is a former Chairperson of Emunah Israel (1991-96), CEO/Director of Kfar Hanoar Hadati Youth Village, member of the Emek Zevulun Regional Council and the Religious Education Council of Israel's Education Ministry. She has degrees in Mathematics and Jewish Education. Every time I go shopping for fruits and vegetables since this year's Rosh Hashanah holiday, when the shmitta year commenced, a smile lights up my face. Does that seem strange, perhaps even unenlightened? Shouldn't I be more obviously worried about keeping the mitzvah properly? After all, really important conferences, articles, lectures, Q & A programs and columns abound in Israel for months before the land's Sabbatical year begins, all of them trying to give observant Jews a handle on the halakhic aspects of the mitzvah or an opinion on what it is about philosophically and sociologically, with many focused on getting through the year without too many mistakes. The shmitta year, for readers who may not be familiar with it, is one of the commandments that are kept by Jews vis a vis the Land of Israel (called 'mitzvoth hatluyot baaretz'). The Torah tells us that the land must lie fallow during the seventh year of the cycle of tithes, that natural produce of that year on soil that is included in the commandment's boundaries (a subject in itself), is free for the taking and is not allowed to be sold for profit. Various issues arise from this commandment, including the date the sale of each product becomes prohibited (most fruits, for example, are problematic next year as they begin their growth during the shmitta year, but ripen the next), how to avoid the prohibition of eating produce secretly planted during the shmitta year masquerading as natural growth (issur sfichin, in halakhic language) and how today's farmers are supposed to survive without planting or selling (there are various halakhic solutions, depending on which group you are in, Zionist or hareidi. Naturally, vociferous controversy surrounds them). Oh, and when buying exported Israeli products that contain produce, if you are Jewish, the same problems arise. The above is by no means an accurate or thorough halakhic desc‎ription, it is just enough for readers who have never experienced shmitta in Israel to know what I am talking about. For more, ask your rabbi, buy one of the many books on the subject or check the topic on Rabbi Google, as they say here. 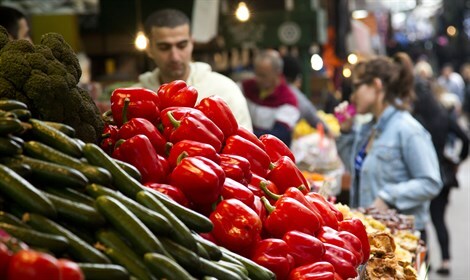 One can avoid involvement in the people of Israel's return to the land by buying pre-shmitta produce (including products that contain produce, whose dates can be checked on the cans or packages), purchasing from Arab farmers or sticking to imported produce. This is no small feat, organized by various hareidi hekscher-granting facilities and considered quite reliable. But the Religious Zionist shmitta year is the one I find exciting. It is filled with an ever present and joyful consciousness that we have returned to the land of our forefathers and witnessed the actualization of the words in Ezekiel that the Talmud calls signs of imminent Redemption: "and you, O hills of Israel, give forth your fruits..for my people.. because they are arriving". How lucky we are! We can be proactive in keeping the laws of shmitta because we are growing fruits, grains and vegetables on our land once more! And the "Otzar Haaretz" (literally, Treasures of the Land) produce markets, which are where my smile broadens, are a result of that miracle and organized to maximize it. First, there are products labeled "sixth year", that is, pre-shmitta. Then, there are products labeled as grown in Israel, but out of the halakhic shmitta boundaries. There are also products labeled as grown on land sold to non-Jews for the year, a solution allowing farmers to work the land and sell the crops as suggested by Rabbi Avraham Hakohen Kook, Israel's first Chief Rabbi, so that the pioneers could survive the year (it is still recognized by Zionist rabbis, though not by all, due to the farmer's finances but also to Arab creeping encroachment on fallow land). Add the most exciting of all, though the most difficult to be careful with – the products supervised by the rabbinic courts (Otzar Beit Din) – products that grow during shmitta, as the Torah mandates, on land that is not sold for the year, products that the poor and hungry can gather freely. Today, these are grown with rabbinic court supervision for sfichin, then distributed while reimbursing farmers for their costs, passing the costs involved on to the consumer. These products have the "sanctity of the seventh year", they are holy as only agricultural products of Eretz Yisrael can be. Every bit must be eaten or drunk (check your grape juice and wine bottles next year) and any peels and seeds kept in a container until inedible before they are thrown away. We have a special container/bag in the kitchen for them and even the littlest grandchildren know what to do. So, as I said, every time I go into that "Otzar Haaretz" store, my heart gives a leap. I think for a second about my young relative, here for a year from the US, who said that she would consider aliya if not for the fear of erring in keeping the land-dependent mitzvot properly. There are those in the Diaspora who do not buy any Israeli produce for that reason. It is a serious issue, but it is a challenge as well. I, far from a halakhic expert, would like to believe that Hashem (G-d) wants us to try our best. So - Thank You, Hashem, for letting me live in the generations that have "Otzar Beit Din" tomatoes that I use to the last drop reminding me that even the agricultural world of Israel is filled with holiness. Thank You for the "heter mechira" (sold land) produce that reminds me that the Torah was given to man to arbit halakha through Torah Sages. Thank You for religious Zionist kibbutzim like Shluchot, that write "product of the sixth year" on their bags of carrots so that people will know they can buy them with impunity – and for the non-observant ones that make the same efforts, even if it is for economic reasons. Thank You for my "Otzar Haaretz" storekeeper, a kippa-clad Iraqi named Chezi with an extensive knowledge of halakha and produce, who explained that the corn was grown outside the shmitta area and reminded me of the boundaries involved. Thank You for an opportunity to live mitzvot that were once only theoretical knowledge and that my forbears longed to observe. And for those of you still to make aliya - think what Torah joy is awaiting you!